1. Break the chocolate into a small heatproof bowl and sit over a pan of gently simmering water, stirring once or twice until melted. Remove from the heat and leave to cool to room temperature. Once cooled, brush a layer of white chocolate on the inside of each pastry case then leave to set. 2. Meanwhile, beat together the mascarpone, crème fraîche and vanilla until well blended, then beat in the remaining melted white chocolate. Divide the mixture between the pastry cases. 3. Arrange the strawberries cut-side down on the filling. 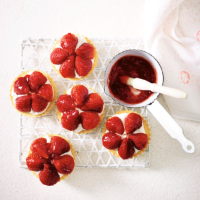 Gently heat the jam with 1 tbsp water then brush over the strawberries to coat evenly. Leave to set, then serve. Best eaten on the day of making.